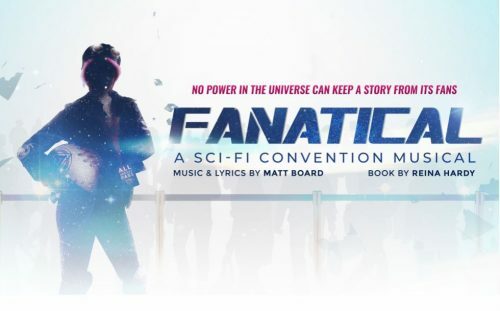 FANATICAL is a brand new musical, ideal for fans of musicals and all things science fiction. It tells the story of how fans of beloved comic book turned TV show Angel 8, can save the day. Set in a UK convention centre; Angel 8 fans eagerly await the arrival of author and keynote speaker Scott Furnish (played by Stephen Frost). Fans, led by Trix (played by Suanne Braun); cannot wait to meet Furnish as the first season TV show of Angel 8 has just finished airing. With a pop score, it is a fast-paced, upbeat comedy celebrating what it means to be passionate about the things you love. Anyone that is a fan of Stargate, Star Trek, Dr Who, Red Dwarf, Blake’s 7 or Comic Con – it is time to get your geek on -book tickets for the world premiere of FANATICAL on at The Playground Theatre. Performances run 8 November thru 8 December. Please feel free to arrive in costume! Also! Click here to view the cast announcement on BroadwayWorld.com! THE HELLO GIRLS: Perky, Pertinent World War I Musical is Welcome!